Lambert Smith Hampton, the property adviser, has just published its review of the Scottish office market in 2017 and makes its predictions for 2018. LSH say that for half of office movers in Glasgow, Edinburgh and Aberdeen (57% of occupiers), relocation was more likely to be prompted by a lease expiry or break option, a pattern that underlines the importance of market churn over inward moves from companies based outside Scotland. Redheughs Rigg, Edinburgh) and Balfour Beatty (43,568 sq ft at Maxim 7, Glasgow). Expansion was the trigger for 26% of relocations, indicating ongoing confidence among occupiers. Expansion also played a part in a number of deals in Aberdeen despite the dip in oil prices, albeit none of these involved occupiers in the energy sector. Key deals spurred by expansion included the University of West Scotland (225,000 sq ft), Computershare (41,395 sq ft) and the Student Loans Company (40,853 sq ft). Common among these occupiers was a desire for better quality office space or a more effective working environment. example, Wescot Credit Services acquired an additional 10,567 sq ft at 38 Cadogan Street, Glasgow while Actavo acquired a further 10,685 sq ft at Alexandra Parade, Citypark, Glasgow. Better quality office space was cited as the key driver of choice in 14% of deals, a notable example being Mott MacDonald’s acquisition of 34,515 sq ft of grade A space at St Vincent Plaza in Glasgow. Improved efficiency was the key driver of choice for 12% of deals, the largest being ST Microelectronics acquisition of 21,530 sq ft of grade A space at Tanfield, Edinburgh. key markets, amounting to just over 2.1m sq ft of potential demand. Metropolis is currently monitoring over 50 Scottish companies with plans to move in 2018 and over 100 occupiers coming up to decisions on leases in Aberdeen, Glasgow and Edinburgh. Recent research by Jones Lang LaSalle indicates that as a result of the new office relocation demand and lack of new grade A office space, office rents in most major UK cities are close to their pre-recession levels. Office rents in Cardiff, Edinburgh, Glasgow, Manchester Central and the Thames Valley from June 2014 have all passed those of late 2007, considered to be the previous peak of the market, prior to the UK recession. Office rents in Bristol and Leeds have previously matched those of the fourth quarter of 2007. Birmingham is the only city where office rents are still lagging behind the 2007 peak. In central London, the City and the West End office rents for Q2 2014 were just below their 2007 peak. Rents for the City are £6 psf below and rents for West End are £10 psf. below their previous high point. The two London markets were hit the worst by the financial crash, with rents in the West End falling 34.7% to £75, and rents in the City dropping 31.8% drop from late 2007. Monthly letting analyses by Cityoffices.net and Metropolis suggest that in some cases individual deals are already surpassing previous peaks with KPMG rumoured to be paying £125 psf for a move to 18 Grosvenor Street, W1 and Golden Tree Asset Management paying £115 psf for a move to 33 Davies Street, W1. In addition, rents at 20 Fenchurch Street (Walkie Talkie Building) in the City are rumoured to be topping £70 psf. A recent office market report on Glasgow by Knight Frank highlighted an excellent year for office lettings in the city. 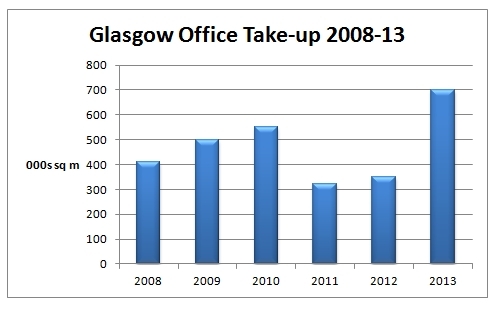 Office take-up for the year reached 700,000 sq ft, which was 30% above the ten-year average (see below). The largest deal was Scottish Power’s 220,000 sq ft pre-let St Vincent Street HQ, but there were also significant lettings to Brodies Solicitors taking 25,000 sq ft, Atos (37,000 sq ft), Ashurst Solictors (25,000 sq ft), JP Morgan (21,000 sq ft), SAS Software (20,000 sq ft), KPMG (15,000 sq ft), Speirs & Jeffrey (15,000 sq ft) and Skyscanner (11,000 sq ft). The Metropolis database reveals just over 30 outstanding office requirements in Glasgow, including Teleperformance and Ministry of Justice looking for 30,000 sq ft each and Aquira looking for 20,000 sq ft each. The thirty firms are currently searching for a total of over 300,000 sq ft of office space in the city, although this includes a lot of sub-5,000 sq ft searches. There are another 35 firms due to make decisions ahead of lease expiries in 2014 and 2015. Total availability of office space in Glasgow, both second-hand and newly constructed or refurbished, has fallen 400,000 sq ft, but only two new buildings fully available for letting. Three Glasgow office schemes are under construction: Abstract Securities’ 170,000 sq ft St Vincent Plaza; Bam Properties’ 163,000 sq ft 110 Queen Street and M&G Real Estate’s 140,000 sq ft 1 West Regent Street. Agents expect over 450,000 sq ft of new office space to be completed in 2015 and a number of existing Glasgow occupiers are expected to negotiate pre-lets. The outlook is that a number of high profile office letting deals are likely to be signed over the next 12-18 months as the new office space comes online. There are also additional sites in the pipeline awaiting pre-let interest. Glasgow is also likely to feel some gain to its profile from the 2014 Commonwealth Games which could help inward investment.